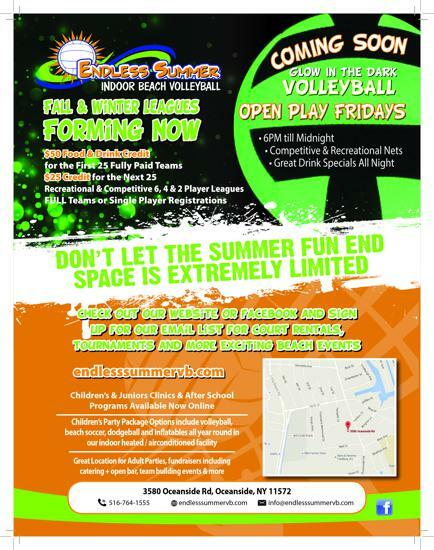 It's Friday so there is only one place to be - Open Play at Endless Summer Volleyball. never closes and the fun never ends. 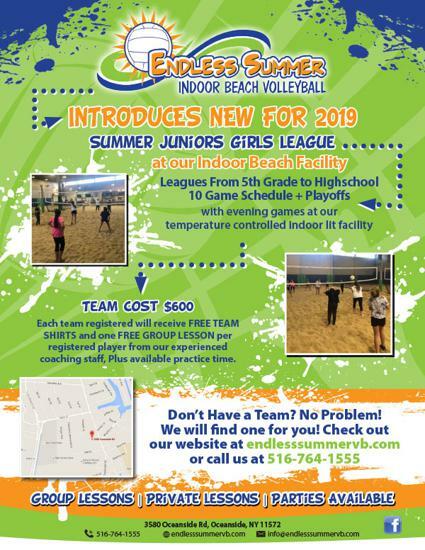 Endless Summer is here to help you learn and expand on the volleyball basics regardless of age. Starting February 2th, we are running a Sunday Evening Adult Only Clinic. This will run 12 weeks so you will be at your best for the summer. The Fall & Winter Seasons at Endless Summer have been full so don't miss out on the last season of the year. Sunday League Start Times are 7 PM, 8 PM & 9 PM. Monday Leagues start at 8 PM. The summer is here so land as the temperatures rise, come on in and cool it down with $1 Beer Night from 6:00 - 8 PM. We have 2 courts - 1 competitive and 1 recreational so we make it easy to find your place. 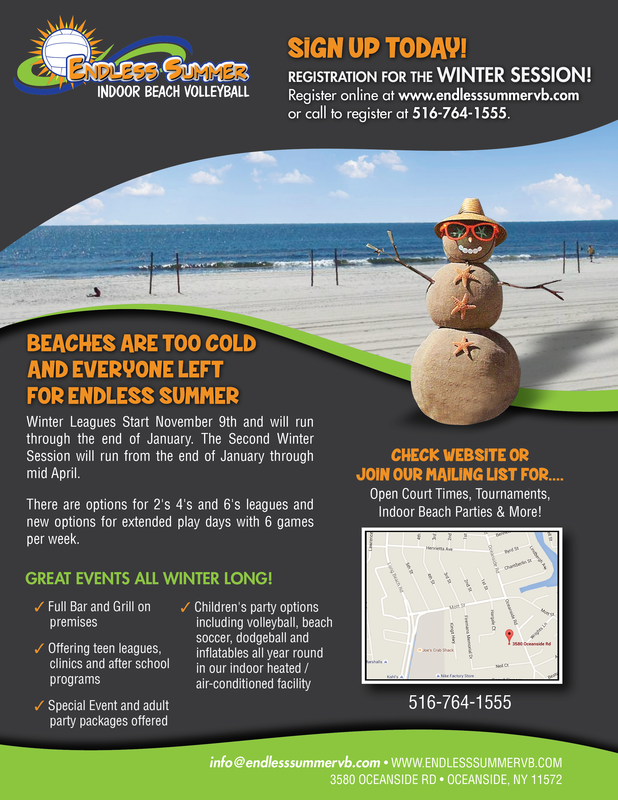 Bring a group or come as you are and join a group on one of our two sand courts. And as always, it's Ladies Night. The beach season doesn't start for a few weeks so we are offering a great way to get the team together and get some game on. $10 per player- play will be held tournament style with a guaranteed minimum of 2 games. Will be giving away credits toward Endless leagues, clothing, etc. The Comeback Kids will be hosting an indoor beach volleyball tournament in Oceanside on Saturday, May 5th at 11:00 a.m. Please register below, or on our website, for a fun day of competitive 6's volleyball to help us "Spike Out Cancer"! There will be t-shirts, raffles, food, music, and giveaways! The ComeBack Kids Foundation was established by Jackie Fiore, a young woman who was diagnosed with acute myeloid leukemia (AML) when she was a student at Boston College I have now been in remission for 12 grateful years. I feel hopeful and want to help individuals in need as much as I can which is what inspired me to establish this non-profit foundation. Our mission at The ComeBack Kids is to provide critical advice and inspiration to those affected by any type of trauma. Through our fundraising efforts, we provide emotional and practical support services, education, and recovery assistance. We are focused on turning setbacks into comebacks! May 5, 2018 at 11:00 a.m.
Last team spot for the Winter..
We have one spot left for 4's on Monday. 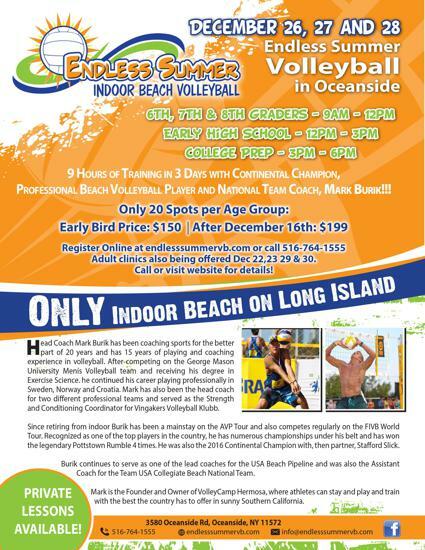 The cold weather & stress of the holidays can't slow down the party at Endless Summer Volleyball. 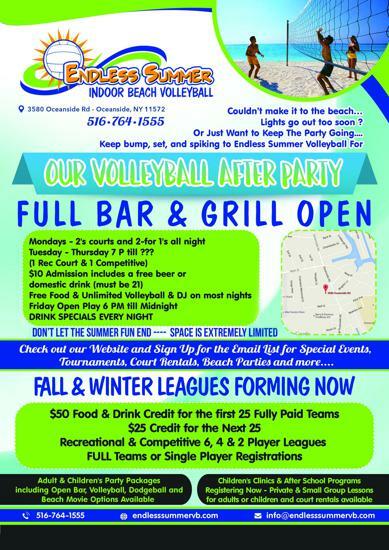 Come as a group or come alone and pick up a game on either the Competitive or Recreational Sand Courts.Play as long as you like from 6 PM till Midnight. Come on down for fun, friends & great drink deals all night. And the newest drinks - Vodka Coconut Water or Rum Coconut - All Night $4. Sharpen your skills, train hard and learn how to win from one of the best players in the country!!! THEN STICK AROUND FOR THE AFTER-PARTY!!! All Levels are welcome. Players will be separated by skill and gender as space permits. ONLY $75 for 2 hours or $99 for the Entire Session. $15 extra if you choose to pay On-Site. Register Here by filling out this form. Endless Summer is almost full!!!!!! Co - Ed With a minimum of one female per team. Spring is here but so is the rain! Come take a break from the break and we'll meet you on the Beach tomorrow at Endless Summer. REMINDER - Sunday Open Play from 6 - 10 closed this week but open again from the 23rd on. April showers Might bring May flowers but not yet. It's still the time to stay warm and dry at Endless Summer. Spring is here and we are still in the 40's - But Endless Summer is still 70. We will be giving away free shirts randomly all night. The forecast for tomorrow is cold with snow. The only thing cold at Endless Summer tomorrow will be the BEER!!! After a long wait, the bar at Endless Summer Is Open Again. We have a few spots left for the Spring season. Introducing the first Endless Summer 4 player Co - Ed Tournament will be held February 25th from 6 PM till completion. Tournament will be restricted to 10 teams and each team will play a minimum of 4 games in the pool play round. Prizes will be awarded to 1st, 2nd and 3rd place. Leagues start in just a few days http://t.co/4KmzEdVZ7u! Sign up today! Don't miss our party this weekend @PieCraft15. We're excited to give away free swag and registrations, pizza, beer and more. 8-11PM on Sat! Programs Offered from 3rd grade through High School. Including our new Club Team Programs. Don't See What you are looking for - Our Coaches can put together a group or program for your needs .